The Pygmy Hippopotamus is very rare and very few of them remain in the wild. They are often found though in a zoo setting. This is the smallest of the various Hippo species. They weigh from 400 to 600 pounds. They also spend more time on land than other species. It is believed less than 3,000 of them remain in the wild today. 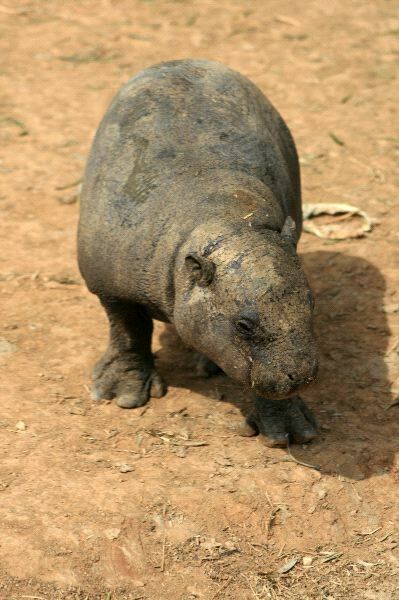 The Pygmy Hippopotamus has a dark gray body that has dimples that appear to be wrinkles on it. They have small faces and very large teeth. They can be very aggressive so it is hard to observe their movements in the wild.